Every writer needs an email list. It’s just that simple. In this article, I’ll share with you why every writer needs an email list, some of the myths about email marketing, and how to get started building an email list today. If you want to write a book that sells thousands of copies or more, you need people paying attention to your work. If you want your message to spread, you need people’s permission to communicate with them. And if you want your words to change something, then you need an audience. 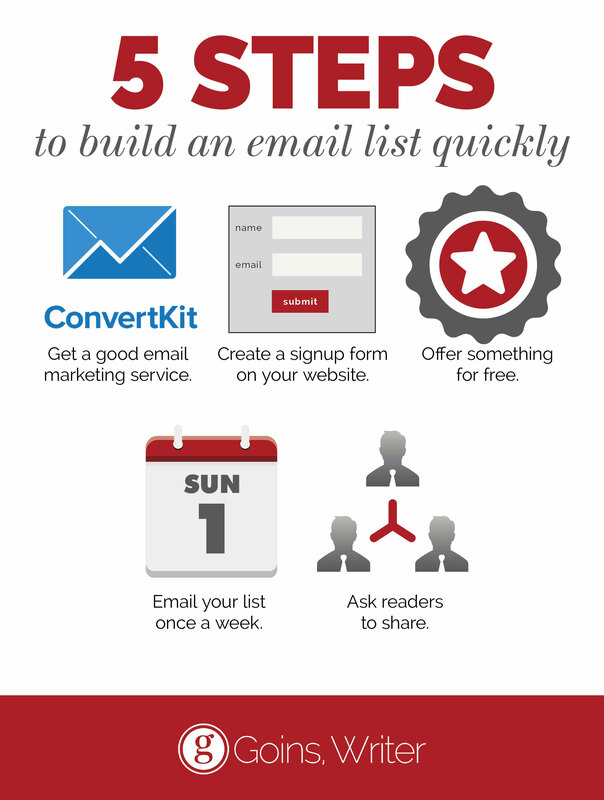 The best way to do all that is by building an email list. Many writers don’t get the attention they deserve, and this frustrates me. Their messages fade into oblivion before they even have the chance to be heard. Why is this? Because many writers neglect the single-most important tool to their success: an email newsletter list. Need help setting up and using an email list? Check out the best email marketing tool for writers and bloggers: Convertkit. They didn’t ask, “How many RSS subscribers do you have?” or “How many ‘hits’ does your blog get?” They asked about my email list: the most important asset an author has in their toolbox. My friend Tim Grahl, the book launch expert, tested this in his book marketing agency and found that email was nearly 100 times more effective than social media in selling an author’s book. 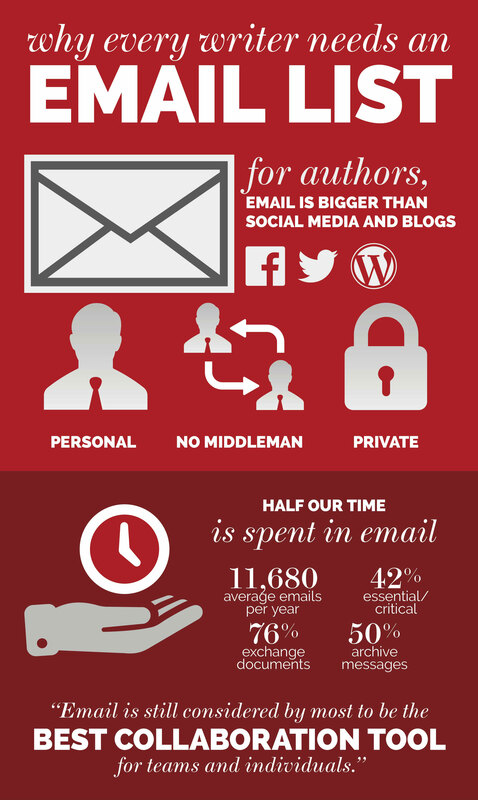 Email is nearly 100 times more effective than social media for authors. I’ve personally seen this myself with a recent book launch where the book sold 15,500 copies in the first two weeks of the launch. Do you know how many of those were sold via social media? About 500. And the other 15,00? Well, that was all thanks to email. Of course, this doesn’t just apply to writers. Musicians use email to get word out about their next tour. Retailers use it to share special deals and drive sales. And of course, authors use it to announce news of their next book. It’s all about the list. And if you don’t have one, you’re in trouble. Email is king. It is, hands down, the best way to build an engaged audience, sell a product, or create excitement around your next project. Without an email list, you will struggle to get the traction your message deserves and leave your fate up to chance. But what actually is an email list? Let’s actually start with what an email list is not. When I say “you need to build and mail list,” I am not talking about that list of your friends in your address book. I’m talking about a group of people who have specifically opted in to receive updates, offers, or other information from you. People’s permission to communicate with them. You need to get people’s permission to sign them up for your list or invite them to opt in. If you don’t do this, you run the risk of spamming people, which is illegal and can come with all kinds of not-so-fun repercussions. A website. Before you can collect people’s email addresses, you need to have some place where you can host a signup form, and this is best done on your own self-hosted blog or website. This will allow you to start collecting people’s email addresses and communicating with them. If you don’t yet have a website, watch this tutorial on creating a self-hosted blog in 8 minutes or less. But wait a second. Isn’t email dead? Maybe you’ve heard this, that people don’t read email anymore or that it’s better to use Facebook or Snapchat or whatever these days. But if you’ve believed these claims, I have bad news for you: you’ve been duped. If email is dead, then why does every social network ask for an email address before you can create an account? Why do most people still check email first thing in the morning? Because email is still the most popular way for people to communicate online. Every day, people check their inboxes (often multiple times per day). They sit in front of a screen, glued to Outlook or Gmail, refreshing until they get that gratification of knowing someone else in the world cares about them. Certainly, the way people communicate online is changing and some may not be reading or using email as much as they did a decade ago. But email is not dead — it is very much alive and well. And being almost as old as the Internet itself, it’s not going away anytime soon. Email is not dead, it’s just evolving. It’s becoming a searchable archive, a manager’s accountability source, a document courier. And for all the love social media get, e-mail is still workers’ most effective collaboration tool. The average worker receives 11,680 emails per year with an average of 32 per day. 42% of all email in a person’s inbox is considered essential or critical. Email is still considered by most to be the best collaboration tool for teams and individuals. People use email for more than sending messages: 76% use it to exchange documents and 50% to archive important messages. If you’ve been avoiding building your email list because it seems like an outdated technology, it’s time to face the facts. Email isn’t going anywhere. And if you’re a writer, you need an email list. Email is personal. It’s a friendlier medium than blogging or even social media. When people see your email in their inbox along with all their other friends, this builds trust. Email is an asset. With Twitter and Facebook and other channels, you have to go through the “middleman” to access your audience. But with email, your message is delivered straight to your readers. You don’t need anyone’s permission. Email is private. When you start a conversation in someone’s inbox, they feel like they can be themselves and share whatever they may be struggling with, what they want, or questions they have. I love the rapport this builds with readers. And beyond that, email is universal. Nearly every person in the world has an email address. With over 3.9 billion accounts in the world (according to a study by Radicati ), three-quarters of which are consumer accounts, email is by far the biggest marketing channel in the world. That number reached 4.9 billion email accounts in 2017 and continues to rise. Email, as a network tool, outnumbers all the users on Twitter, Facebook, LinkedIn, and every other social media channel — combined. That makes it the world’s largest social network. If you haven’t tapped into the power of email marketing, then you’re missing out on an incredible opportunity to engage with the people who want to hear from you. Create a signup form on your website. It needs to be obvious and not hideously ugly. If your website doesn’t have a clear opt-in form, then you’re missing out on a lot. Tools like ConvertKit and Mailchimp make this easy with their own WordPress plugins. Or you can use a pop-up with a tool like Sumo. Offer something for free. This can be an eBook or a free article series or whatever your readers find valuable. It’s a way to reward subscribers with something other than just your regular content. For a step-by-step tutorial on how to do this, read: The Essential Guide to Writing an eBook and Sharing it with the World. Start emailing your list something new once a week. Don’t overcommit to a frequency like once a day or even a few times a week. Start small and be consistent. A weekly newsletter is plenty. What should you send? Whatever you want. For many, just a short message or article is a great way to begin. Your main goal is to add value and be helpful, so that people continue to read and pay attention. If you make it about them, they’ll make it about you. Ask readers to share. If you do a good job of adding value, people will want to share your stuff. But it doesn’t hurt to ask them once in a while to tell their friends. For this I like using clicktotweet.com and have readers send their friends and followers to my newsletter signup form. And then, what do you do once you’ve launched the email list and started collecting subscribers? Once you have the right tools and start building your list, where do you go from there? Well, hopefully forward. But here’s an important tip: Instead of seeing your email list as “yours,” what if it was theirs, something you shared with your community, something you stewarded instead of hoarded? When people give you permission to talk to them, you have a great opportunity and an important responsibility. You can choose to invite or interrupt. To exchange ideas or blast out information. To give or take. If your email promotion is a taking, not a giving, I think you should rethink it. If you still want to take the time and attention and trust of your 4000 closest friends, think hard about what that means for the connections you’ve built over the years. There are few promotional emergencies that are worth trading your reputation for. It all comes down to trust. If you build something special, it will draw people in and keep them there. Good luck. But maybe this all sounds confusing and you aren’t quite sure where to start. I totally get that. It was for me, too. This stuff can get complicated, and sometimes you need someone to hold you by the hand and walk you through what it takes to build an email list and use this tool to grow your readership. Sign up for ConvertKit. This is the best email marketing tool for writers and bloggers. They will help you get your list set up and working right, install the right forms on your website, and even help you grow your list. Check out Convertkit to begin. Register for a free training on growing an audience through email marketing and blogging. Bonus: Read my post on advanced tips for building and growing an email list. Do you have an email list? Share in the comments. I do a subscriber appreciation giveaway once a year for my email list and always get a few new subscribers that way, but like you mentioned, I need to come up with an incentive that’s offered any time. Will have to give it some thought. Very interesting to know that the email list is the thing your publisher is interested in. Thanks for passing that along! I really like the big email opt-in + incentive at the top of this theme. Is there a way to customize this in standard theme? I’m just not sure I’m ready to switch to a whole new theme at this point. Thanks, dude. That’s particular to Genesis and baked in to this child theme. It’s the reason I switched. As far as I know, Standard doesn’t have anything like this, but it’s basically just some code you’d need to add to your homepage. May be worth asking the 8bit folks about. Yes. All around. I ran my blog for a couple years before REALLY tapping into the importance of building an email list. It’s now the primary call-to-action on my site and the results have spoken for themselves in even a short amount of time. Agreed. This was a surprise to me, actually. I had NO idea how important it was to send personal messages to people’s inboxes. It’s invaluable. Are you a fan of having a separate newsletter for getting Emails – or of having your blog content delivered via MailChimp? I think Michael Hyatt does the latter, but I’ve seen most people do the former. Loren, great question. I’m a fan of doing what works for you and your tribe. For me, I found pretty early on that it was important for my newsletter to have a unique feel to it. I intend to combine my Feedburner with my newsletter provider, so that you can get daily posts delivered to your inbox and/or the weekly newsletter. I’ve really enjoyed the trust I’ve built with my newsletter list, though. It’s a unique relationship I have with that group; the content is different from the blog. Mike’s way is one way to do it (and it certainly works for him). 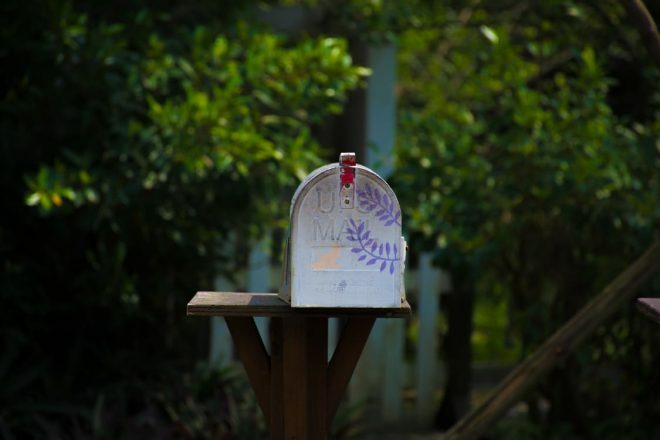 Another way is to make your newsletter unique and use it to provide unique value to that list. Chris Brogan is doing thing, as is Daniel Scocco of dailyblogtips.com. I like it, too. I think you’ve really got something here, Jeff. I read (and enjoy) your emails because they are unique communications that are written with a very friendly, personal, warm way. I like the fact that you send them regularly, but not too frequently. And I like the links at the bottom and often click on one or two of them and read more of your thoughts on your blog – but I appreciate that they are really low-pressure and I can skip them, if I’m busy, without feeling disloyal. There’s definitely trust involved in receiving and reading your emails (and occasionally replying, when I have time! 🙂 ) and I appreciate everything you do to create and nurture trust with your readers. Excellent post, Jeff. Much needed – thank you! I never would have dreamed that you get more replies from your newsletter. For some reason, I feel as if I’m getting in the way of the author when I reply to emails. It’s different than commenting on a blog…it gives the author the choice to ignore my response. Hah. What’s interesting is I only get a lot of replies when I ask a really pointed question. Glad this blog is helping you, Elizabeth! I’m standing right (behind) Elizabeth! This feels like a far off world since I only started 8 days ago….but I’ve already been sucked in by subscribing to your email updates! Are you kidding! When I opened my bead shoppe in Nashville six years ago, I started collecting email addresses immediately upon opening the doors. I have a place for people to subscribe, as well as a Facebook and Twitter account. I use Constant Contact, which is expensive, but it’s pretty sophisticated too. I send out emails all the time, and when I self-published my two books on the business of beading and jewelry design, I emailed everyone. It’s a constant reminder to people that you’re still around, and if you write something noteworthy, they do read! I also have a radio show on Blog Talk Radio. Jeff, if you’re feeling squirrelly, you might want to try this someday. You can talk to people live. On my website, I have an archive of radio shows, and people love picking one of interest and listening to it. A businesses e-mail list is going to be the backbone for any marketing that they are going to do. So few people talk about this topic. It’s not hot topic of the year, but it is really important. If your going to help someone grow their business, this topic is a must. Thanks for covering this. no prob, Andy. thanks for reading. I just started my email list a few months ago and it is the single most FUN I have. I can say a LOT more than a tweet or post, and I can promote other writers’ work easily alongside mine by sharing their work. It’s terrific and each week I get an update about how many new subscribers I have–and that’s another thrill. i love that you’re having fun with this, Deanna. I’m curious: what exactly do you send to your email list, and how does it grow your subscriber list? Aren’t the emails from your subscriber list? I have not started an email list for my blog yet. I’ve thrown around the idea but haven’t implemented it yet. Most likely in the next 2-3 months I’ll have one up and running. hi joe. i wouldn’t wait. you learn as you go. best thing to do is just start. I agree with you 100%! An email list is a huge asset for you when it comes to your marketing efforts, for all of the reasons that you’ve outlined. Both of those have work very well for me. Hey so I’m sold on starting an newsletter and email list, but what do I put on it and how often should you email people? I hope to start mine in March. My tip would be VERY,VERY careful if you move from wordpress.com to wordpress.org. I lost my email subscribers making the transition. DOHT! yeah. the mailing list function of wordpress.com doesn’t seem very transferrable. i’m not a fan. glad you moved, though. The upside is that most people switch at some point or another so the sooner you make the jump, the fewer total subscribers you’ll lose since you can transfer some over and start rebuilding your list before it’s super big and you regret not transferring earlier. I’ve been hearing a lot about email lists recently, guess this is something I need to invest some time in. The only problem I have is that the few mailing lists I have signed up to just seem to send me links to the sites blog content which I don’t really want (as I am probably subscribing to it on RSS). right, James. I don’t care for that, either. that’s why I favor a unique content approach. Chris Brogan does this, as does my friend Mary DeMuth. Thanks Jeff. I’ve given it a shot and added MailChimp. This is so funny because my husband was really the one who convinced me to start an email newsletter over a year ago. I was so unsure at first, and it certainly took some time for me to understand the benefits. Thanks for reminding us of why email is still such a useful tool for bloggers and writers! that’s awesome, Suzannah. glad you listened to your husband. Are you talking about an email list that is separate from receiving blog posts in their in box? If that’s the case, no. I don’t have one. That’s the newsletter, right? It’s a weekly email? Thanks for clarifying! right. that’s what i’m talking about. it can be whatever you want, but i use the weekly format with a unique message. yep. for what it’s worth, i love this theme’s use of the “feature box.” it’s helped me distribute my eBook to thousands of people. Alright alright. You convinced me. I’ve added “email list” to my blogging to-do’s. Thank you for the insight and smack upside the head. Read this article and felt very ‘convicted.’ It also reminded me that I need to do a new newsletter, so I began searching your site for an article on what makes a good newsletter. Have you written one? Will you? Awesome points, Jeff! I’m starting this now on my blog. Thanks!! This might be a silly question but I’m learning! 🙂 Do you have feed burner and mail chimp working together then so that feed burner doesn’t e-mail your daily posts but mail chimp would (still allowing feed burner to handle the RSS subscribers)? And is your newsletter a totally different list than your blog e-mail subscribers (other than those who subscribed to both, of course)? Thanks! So appreciate your writing! Hi Erika. Good questions. I run my RSS subs thru Feedburner, but use Mailchimp to send unique, weekly messages. Feedburner still delivers daily posts via email and RSS. I may switch over to Mailchimp’s RSS campaign soon. Try ‘Immediate List Building Pro’. I used it and my subscribers rate went up by over 250% in just 2 days. Plus it offers more than just building lists..
Great tips! I am trying to build my brand and this should help. I can use all of the help I can get. If I buy the Tribes theme, does the Genesis Framework come with it or do I have to buy it separately? Also, how does having the Genesis Framework affect my current use of WordPress (I have a self-hosted site that has WordPress automatically loaded to it). Tim, sorry for the late relate. You need to buy Genesis, install it, and then get Tribe. They’re separate. The Genesis Framework is just like a theme (Tribe is a “child” theme). All WP sites use themes (the default is 2012). Jeff, a question I have is “What do you do with those emails?” Should I send regular newsletters with the most liked posts? Should I make it like feedburner/wordpress emails that send every post? It’s up to you. What people want? What feels possible to you? The bigger idea is to be helpful. I would like to write more but find that it takes me a long time to compose anything.I have a website and am an affiliate and after clicking emails and surfing traffic exchanges I am a bit mentally tired.I started off with a goal of writing a post a month.My next article is going to be about why do you need to have a list.This is how I am at this site I am doing research. Jeff, I love all of your posts about these kind of things because you simplify it. I am very overwhelmed by all of this technical stuff. I’m hoping to put your advice to work soon (this week hopefully) and get my blog up-to-speed as a self hosted blog, and I’ve already created my account with Mailchimp. Thanks again for all of your help! I get it. It’s overwhelming. But once you start seeing people connect with your content in meaningful ways, it becomes a responsibility. A compulsion. Something you’ve GOT to figure out so that you can reach the most people possible. I don’t understand what an email list is, exactly. How does it work. I’m still a little bit confused on that. I think they mean an email list is a the people receiving your emails. Yep. The list of subscribers who have given you permission to communicate with them. Another awesome and very helpful post! So true. I so love reading newsletters from blogs I follow. I read mostly on Feedburner, but I tend to look for more opportunities to engage by signing up for email lists. I started building an email list from the beginning and seeing a new subscriber notification is like almost like getting a sweet virtual high five, too! Not only helps me see what the readers enjoy most through open and click rates, replies, etc. But it keeps me motivated and excited to watch the list (slowly) grow. Keeps me motivated, too. Thanks for sharing! I actually was against email until I read “Platform.” I decided to give it a try. Not only did I get quite a few emails on my list (for the size of my blog), but I instantly saw my “hits” go up, as well. It was amazing. Now I’m up to over 270 email subscribers and, hopefully, growing! Great reminder post, Jeff! Wow! Way to go, Adam! I understand the value of email, I just don’t understand what exactly it is that we’re emailing the list, besides the regular updates that go out. And if the list is a list of our subscribers, then how does mailing them grow the list? You send them whatever is relevant. Growing the list happens by creating content people want to share and then rewarding those who opt in. Thanks for this post. Do you repost your popular posts once each year? Just curious? I’ve setup mailchimp but don’t know yet how to really use it, working on that today. I also appreciated your webinar with Tim Grahl. I’m sold on building a list, need to get some technical pieces worked out. Hi Dave, I sometimes share posts from the archives that I think are still relevant and would help people. I basically rewrote this post after doing some research on the subject and to help raise awareness for the free course I’m teaching with Creative Live. It’s funny you would write about this now! I was just researching on the web on how to grow my email list. I am really considering Aweber. Thanks for the post! Full disclosure: I started out on Mailchimp and recently moved to Aweber. Both are good. I’ve been writing a series on my blog about building your email list 🙂 People shy away from building an email list or giving away a freebie for an email because they feel it’s “markety.” With the way social media is moving towards a “pay to reach your fans” model, email is vitally important. Even if you lost all of your friends and followers on social media, they would still see your content if their on your email list. And if you ever want to create an online business, your email list will be your best possible leads/customers. As long as you add value and serve your list really well, people will stay and tell others about it. 1. It’s sleazy and slimy. 2. It’s a way to allow you help more people. I think of it as the latter. Great article Jeff. Thanks for sharing. Right on time. I’m getting to work now on building my list at choose your best life now dot com. This is one of my New Year’s goals. Great tips, Jeff. And thank you for all of the hard research tips here. The numbers, currently and in the future, are very helpful. Another confirmation that your emails are getting through to you readers. I will be sending out a rebelmouse update and since I clicked over to my browser and will be sharing this post, there is more reasons for sending email to those that care about your work; that little letter can multiply into future readers because of your hard work. Jeff, I noticed that you started using the scrolled triggered box to get people to sign up for your newsletter. I’d be interested in whether or not that has actually increased the amount of new subscribers and what your take is on how to use it best. It seems like it could get a little annoying to readers after awhile. It has. People can X out of it so not many complaints so far. It’s an experiment. By the way, I thought the addition to your blog of this was a good one Caleb. There is a lot out right now regarding a focus on your list (I know you’ve been a consistent advocate for a long time). But please, please, please people – don’t send your list garbage, hard sells (all the time), or 2,3, 4 or more emails per day. Amen! 4 emails a day?! I appreciate your article Jeff on starting up an email lists. To get started i took your suggestion and set up an account with Mailchimp. My account is confirmed but I’m lost. i don’t know what to do next. I don’t have a current email lists and need to learn how to use Mailchimp to get one. You mention in your newsletter that an awesome application is essential with giveaways, i.e ebook,etc. i agree. Is there a place on Mailchilchips to assist me in completing the process to get started with an awesome application? Your article on setting up an email lists is just what I needed to promote my books. Thank you, and I look forward to your response. There are also some affordable training programs online (I recommend this one: https://takepermission.com/community/master-mailchimp-now/). Really timely post for me. Relying on Outlook now…cumbersome at best. HOWEVER, have contracted someone to get me going on MailChimp and on the radar to start the conversion next week…..awesome! Jeff – never underestimate the timeliness of your words; they are powerful and can help someone over a hump….like the BUILDING EMAIL LIST post did for me….perfect timing; working with Matthew Casteel…..and was able to take step 1 on improvements to my site…a huge step in the right direction. I start collecting email since 2011 and now I get the huge list to promote the product to my list. However, it’s hard to find the best product to promote. Why not build one just for your readers? I take notes on how you manage your list Jeff. I’ve never received anything in my inbox that hasn’t been of value. I’m using Mailchimp right now and finishing up a short ebook to give out to help my community and continue to grow the list. Thanks for your tips and insights! Thanks, Sean. That means a lot. Thanks for the information. Sadly this is a neglected area in my life! Will try to rectify that soon. I haven’t been able to grow my list past 200 in the last year… and I think I’ve cracked it. I’ve got to give away more in the email itself, instead of ending it on a cliffhanger and asking the reader to click through to the site to read the full post. also sign them up as email subscribers to the wordpress.org blog? Jeff, I enjoyed your livestream talk on this today. Thanks for all the great information. I love this post. I was contemplating whether or not I should make an incentive. Thanks Jeff! Thanks for a great point. To the point and very clear information about why we should start an email list. I think some people just don’t understand how it will benefit them if they want to grow a business. I have just set up a new website and I made sure I added an opt in form to collect email addresses before writing my first blog post. Now I can focus on delivering good content through my blog posts and when people start to subscribe to my list to make sure I take care of them and engage with good content too. Thank you for this very informative post! I’m new to the blogging scene, so I appreciate all the information I can get. Thanks for sharing! Yep! It went from 75 subscribers to 1000 in a week! writing an even better article. Thanks for this – am looking for ways to get my books out there and this seems like a good idea to try. I’m glad to be part of the tribe. Great content! I wish I was not so dam scared and lazi ,my typings bad my words are bad and my spelling is bad as you can see as you read this .what I have to share worries me . but all these tools you give are great ,it can be done . the things I have said ,people look at me as if I have lost my mind .all I have is my wife ,2 kids ,and a couple of frinds .the realityto my story has become my lifes obsession .its so overwhelming that it causes my depressing and severe anxiety . Tom, I hope you are still with us. If you have a wife and kids, that’s a HUGE blessing the Lord has given you. Oh, and even friends! For bad spelling, there is spellcheck. For bad other things, there is other help. Please read the book MAN’S SEARCH FOR MEANING, by Victor Frankl, for a start. I have been through a very similar hell to the one you have been through, and I survived, with God’s help. I will pray for you. I hope you get this message, and if you do, please write back. Thank You , If I didn’t have so much faith and love for God ,I would not be here today . Its very hard to decide who to love more . The xwife and the 2 kids she gave me ,or the one who it took about 45 years of my life to realize who has always loved me . I would say my mother who passed away 3 years ago yesterday ,and never having a father all my life . But in 2010 I said ,I do have the best father a man could have ,My heavonly father ,and then my life changed for the worst ,but I knew that’s the way he wanted it to . So I could know that he is the one to trust ,love and have faith in . God loves me and that’s all that matters anymore .Even though my family cant beleave in God the way I do ,which leaves me alone .Maybe one day they will beleave in what I beleave in . Tom, thank you so much for writing back. God bless you. His love IS all that matters. You’re not alone–Christians are very scattered these days, that’s all (and maybe we always have been). You can pray for your family to see the love God has for them. That is a beautiful purpose for a life. I myself have only that little mustard seed of faith, so I have say that it is only God’s love for ME that has kept me alive. There are earthly fathers it is better not to have had; trust me on this one. I realize it is time to take the next step. So I am going to put work into creating an great email subscription building a email list from today on…. Email is in fact not dead but very much alive. I’ve been in the email marketing industry for 5 years now and seen significant increase in ROI. But you must have good quality data in order to succeed in email marketing. I want to thank LeadFerret for providing me with the best data out there right now! Just read your ebook BUILDING AN AUDIENCE, and something clicked. I figured out that my model of being a writer was obsolete, and you told me what the new model was. And it’s still all about writing. With this knowledge, I’m already on my way. Thank you. Thanks Jeff for sharing this post. As you know that email marketing could bring us a lot of benefits while we are doing online business. My friend suggested me one email list service provider https://www.itmailingcontacts.com. I would like to recommend this email list service provider helps us to provide most accurate and cost-effective way to reach our prospects! Thanks, Candace! Love that. Appreciate your sharing. Great ideas. I spend hours reading email every week. More than once a week for my favourite bloggers is definitely too much. Thanks for the perspective, Brian. Great advice. Of course, the next step is creating great content that people want to read! Thanks Jeff. As a writer I’ve experienced this and its absolutely true that every witer needs an email list. Email is still trending and can’t die. Just my simple take. Thanks. Jeff – Would it be possible to receive an audio of your presentation today? Just when I think I’m done with email marketing, I realize that it has such potential which I’m just not really using! That’s why I’m so grateful for people like you to remind me that there is so much to do for email! I havne’t, Dainis. Sorry. Really like ConvertKit. Jeff, Would it be possible to receive an audio of your presentation today? Very inspiring! Thank you for considering. Great Post! This is a very helpful post. Thanks Jeff. Thanks for this post Jeff, just what I needed to read today! I recently had my first guest post published on a major site in my field and my modest email list doubled as a result. It’s still a modest list but it gave me a very clear idea of the enormous growth potential. Reading this blog post, I am more convinced than ever that that’s where I need to put my energy now. Jeff I totally agree with you, you nailed it. An email list is the ultimate when it comes to Internet marketing. I also think Getting attractive book cover is an essential need for every writer. I was really upset and discouraged when I was getting good reviews for my book but lack of conversions. I found an agent https://goo.gl/opVdr1. who provides me with real quality and unique book cover design which brought human traffic for my book https://goo.gl/opVdr1. Now I write with passion and joy because I know I have an illustrator who will be able to capture all my idea into a captivating cover design which is the first thing that prompts a potential reader to pick up any book. I have been using his services for sometimes now and he is the best so far. I did everything in the article. Fifteen people have has my novel six months. One finished quickly and called extatic. I know the others haven’t. If they had they would have called, the last eleven pages are shattering for the reader. I answer the question, “what is man’s greatest flaw?” In an way that the words undeniably apply to everyone. No one will read it. Not even my english professor that put my thesis in the ‘best of the best’ cabinet. I stopped trying. Then I read the board of the Pulitzer will read it. Then I read 80 books that won. Mine of fuel evento come close yo saying two immensely huge things people have tries, almost saying it, bit mísera for 800 years. I broke every rule, hit all of the 31 do’s and super violated the laws of prolog and epílogo. But I killed. I have an art degree I’ve nevera attended creative writing classes or a lecture. But, I am so confident I’ve done something many will acclaim and I’m confident I wrote the sleeper that took the Pulitzer. All because nobody, but Donna read it.